“I’m The Liver” is a less-than-perfect Shameless episode in the way Shameless episodes are most often less-than-perfect, a result of the show seeming to always know exactly what to do with Fiona all the time, and having a more tenuous grasp on what to do with all of its other characters. That isn’t to say the writers actually don’t know what to do with the characters, and it’s always impressive how they manage to keep so many characters occupied at one time, even while keeping a tight focus on Fiona. But this early on in any season of Shameless, there’s not enough meat on the bones to feel engaged in anything going on with the supporting characters. 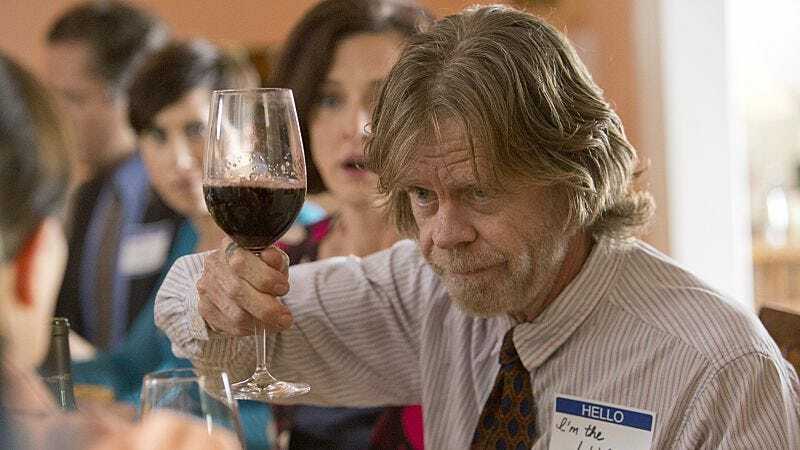 “I’m The Liver” fits into the broader Shameless tradition of starting with a few episodes that shuffle along fine enough before the season starts really paying off. Though it’s tough to quibble when the Fiona stuff is this strong. No one can ever accuse Shameless of taking it too easy on Fiona in the wake of the Liam incident. Admirably, the show also hasn’t punished Fiona excessively. The writers have navigated the aftermath in a measured way, and Fiona’s unsuccessful attempts to woo Sean are the latest step in her long walk to redemption. As Shameless ages, it veers closer and closer to becoming a pure addiction narrative, and Fiona is still navigating the denial phase. To a certain extent Fiona’s denial is understandable, due to the house arrest bracelet she has to wear. House arrest has created for Fiona the illusion that she’s flying straight on her own, when she’s actually being micromanaged day and night. Because Fiona has developed that perception of the house arrest, she sees the bracelet as some sort of ornament representing a storm that has finally started to break. As anyone paying good attention knows, Fiona is capable of being her worst enemy, and she loses sight of that at her peril. Someone with Fiona’s instincts has to constantly second-guess herself. That doesn’t always mean she has to make a different choice, but she can never take for granted that her reasons for making a certain choice are noble, reasonable, or wise. Fiona doesn’t appear to have given much thought to why she’s attracted to Sean. Because he’s handsome? Because he’s her boss? Because he’s not as easily drawn in by her feminine wiles? Or is it maybe because she knows he’s potentially terrible for her and can’t help pointing her vessel toward the rocks? Whatever it is, Fiona hasn’t paused for even a moment to consider it, but because Sean considers recovery a lifestyle rather than court-mandated punishment, second-guessing his pleasure-seeking instincts has become a reflex. Sean has to ask himself why he has the urge to pummel a jerk who calls Fiona a name and withholds a tip from her. He has to wonder why he stays next to Fiona at a 12-step meeting, letting her play footsie with him rather than immediately getting up and seating himself elsewhere. Sean and Fiona’s scene in Gallagher Manor is phenomenal, and Emmy Rossum and Dermot Mulroney play it beautifully. It isn’t flawless, if only because Fiona acted as though Sean was giving her brand new information, and while Fiona obviously has more room to grow, we’ve been led to believe she’s more self-aware than that. A little more recognition from Fiona would have sold the scene slightly more. That’s not a huge dent though, considering Fiona is still figuring out how to walk the straight and narrow of her own volition, not because she’s trying to redeem herself with Lip or satisfy a parole officer. She still needs direct supervision. After she strikes out trying to find a plus one for the show, with Sean, Vee, basically everybody else on the south side, she winds up taking 14-year-old Debbie to the show instead. The results are predictably disastrous. If that feels repetitive, that’s kind of the point. Fiona is at a crossroads, and she can either choose to take Frank’s path or to take Sean’s. The decision is hard when one path offers immediate gratification while the other doesn’t, and the cycle of falling down and getting up continues as long as she chooses either path depending on her current mood. The Frank story is gross and unbearable, and maybe that’s the point too. It would be nice if Frank was the sort of person who would try to clean himself up after narrowly averting death, or at least the type of person who wouldn’t walk into the home of his organ donor’s parents and drink wine in front of them. That’s who Frank is, and I respect the writers for resisting the far easier route in which Frank redeems himself. But the result is still a character I don’t care for taking up screen time in a show with a ton of characters I’m more interested in. Sometimes Frank says and does incredibly funny things, but he costs the narrative too much relative to the value he offers. Frank’s return to his old ways has most adversely affected the Shameless characters who revolve around him, the ones who spent last season trying to ensure he wouldn’t die. Sheila has been pushed to the show’s periphery for ages, but now feels slightly more tethered having finally acknowledged that life with Frank, for all its burdens, is better than growing old and dying alone. Carl, Sammi and Chucky, on the other hand, are floating in space now that they’re no longer acting as Frank’s support system. It’s really too bad because Emily Bergl has done stellar work, and if Sammi having Chucky take a crap on Sheila’s coffee table is as good as the character gets, I don’t understand the purpose of having Bergl as a regular, as great as she is. The Ian-Mickey-Mandy plot with the Westboro-style doomsday protesters felt a bit dated, but that was easy to forgive since it resulted in the type of gross caper Shameless used to do all the time when it was a more fun, but less essential show. It was also an elegant way to check in with Ian as his manic behavior continues to escalate, as well as some quality time for Ian and Mickey. It’s always nice when couples support each other’s interests. Svetlana was doing the most this week. The absolute most. Who breastfeeds someone else’s child? Kevin screwed up royally. I barely understand human emotions and even I got why Veronica was so pissed off. Is there larger significance to be gleaned from Holly and Ellie being mean to Debbie? Or is it just teenage girls being socially violent in a general way? This might make me a terrible fan of the show, but I remember neither how Carl broke his ankle nor how Svetlana got pregnant again.